Monitoring ridesharing driver behavior | Michael Hirsch, Ph.D.
On a recent Uber ride, the ≥ 4.8 rated driver was quietly friendly, had a clean, nice car, and drove efficiently. However, that included driving 50% or 20 mph (32 km/h) over the speed limit on a curvy road–a bit scary. I didn’t want to comment as it might have distracted the driver at a key moment, when I could hear and feel the tires just on the edge of chirping on the turns. I didn’t want to four-star the too-fast driver, to avoid lowering his average (4.6 is commonly cited as a driver threshold below which warnings are given). On Uber’s categorized positive review buttons, I did not click the “driving” button. That is, I did not compliment the driving, while I did compliment the other categories. I still felt something needed to be said, and I considered editing the review, or contacting Uber support. However, I felt both these options could lead to adverse action against the driver by Uber, since 20 mph violations are said to lead to a failed Uber background check. In the end, I simply tweeted mentioning @Uber_BOS that they should monitor drivers for excessive speed. That may seem a little lame, but I didn’t feel the driver was trying to do anything wrong or was careless, but rather that the driver probably just thought he was driving well. Uber is enabling driver monitoring for excessive speed and acceleration, so Uber already or soon will know about drivers using excessive speed. On a previous trip, a driver was jamming music really loudly. This is the only trip I recall where the feedback screen included a button for Music. 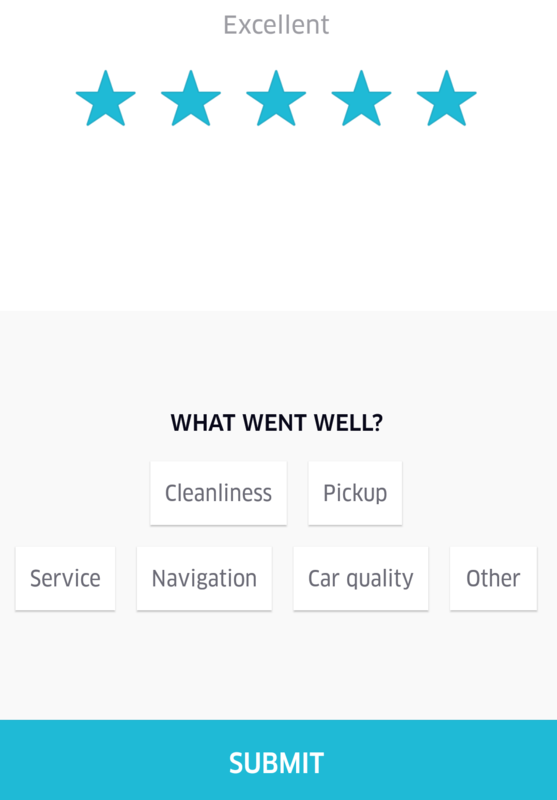 So apparently Uber is adjusting feedback buttons to prior complaints, to see if other passengers will compliment or decline complimenting the loud music. Good idea! Uber should go to a Good/Bad binary system as Fasten uses instead of the 5 star system. Too many Uber/Lyft passengers don’t understand that less than 5 stars is a failing Uber feedback grade.